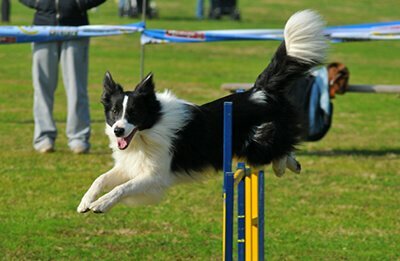 BKC offers agility classes, barn hunt practice, and dock diving. Billings K9 Coaching Center is a private outdoor training facility for dog sports in Billings, MT offering dock diving lessons, NADAC style agility, and barn hunt practices. The swimming pool is above ground and holds 27,900 gallons of water (21’x41.5’x4’). The dock is 40 feet long by 8 feet wide with a non-slip surface and sits two feet above the water. Billings K9 Coaching is a North American Diving Dogs event hosting facility. The agility area has a sand/compost mix surface and is 65’x70’ with an additional area for barn hunt. If it’s dog sports, your looking for, you’ve come to the right place! Although a 15-pound, perky-eared dog named Niners is drawing praise for her dock diving skills, the pooch’s other talent seems even more important. “She’s the most loving, sweetest dog I’ve ever met,” said Pam Horner-Pfau, Niners’ adopted owner. 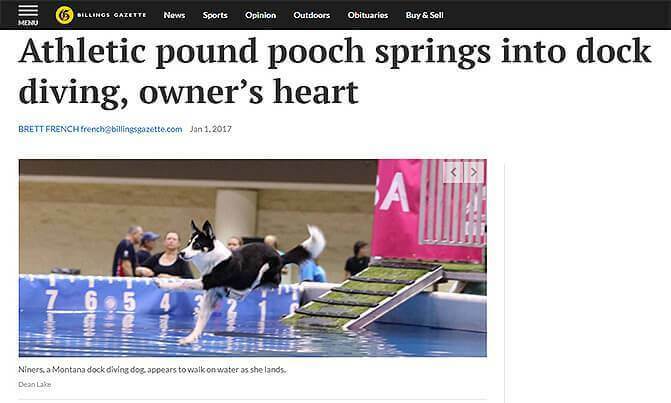 Because of that affectionate nature, the dainty black-and-white pup that seems fearless about flying into water has become somewhat of a lifesaver. My 7 year old spaniel mix, Padmé, absolutely loves agility. Pam has done an excellent job in coaching her. Even when Padmé hasn’t done any practicing for awhile, she still never skips a beat. She loves it so much. She also hated the water, but after getting into the pool with Pam, her mind was changed. I took her fishing and she got into the river 3 times for a quick swim!!!! Pam is a great dog person, she treats everyone and there dogs with respect. I would recommend getting your dog out to cool off at the pool in this hot weather. Pam is great to work with. Up beat and positive. I look forward to many more training sessions with her. Thanks Pam for the Intro classes to see if it’s something we would like to learn more about.